The first thing to do at Viridian City is to go northwest into a narrow corridor. You'll find an Itemball there which contains another Potion. There's not much to do in this city right now. 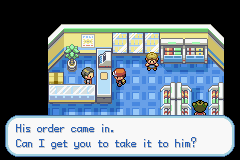 Go to the PokeMart now, and the salesclerk will give you Oak's Parcel for Prof. Oak. Note that you cannot purchase anything for now. There isn't much else to do in Viridian City. After you get Cut later in the game, you can cut a tree in the southeastern part of the city to get to a fat guy. He's a Move Tutor, and will teach you Dream Eater. But you don't have to worry about that now. For now, go back to Pallet Town. For a quicker way to get across Route 1, you can jump over the ledges to avoid wild Pokemon. 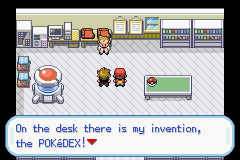 Once you're back in Pallet Town, go to Prof. Oak in his lab, and hand him the Parcel. Gary will come in the lab again. Prof. Oak will then give both of you PokeDexes, essential tools to identify Pokemon. Prof. Oak will then give you five PokeBalls for you to catch Pokemon. Leave the lab and go to Gary's house, which is the one that's right next to yours. You'll find Gary's sister, Daisy, sitting at the table. Talk to her and she'll give you a Town Map. After that, it's time to leave Pallet Town forever (well, not really) and head to Viridian City. Go west once in Viridian City to get to Route 22. Here, you'll be able to fight Gary once more. His Pokemon (two of them now) are a little tougher than before, so be careful when you battle him! The good thing is that you gain a lot of experience points after battling his Pokemon. After the intense battle, you may buy things at the PokeMart or heal your Pokemon at the Pokemon Center. After making sure that your Pokemon are at least lv. 10, head north towards Route 2. Before you go there, an old man will first show you how to catch Pokemon. After catching a Weedle, the old man will give you something called the Teachy TV. Watch it when you need answers and help with certain things. Route 2is quite short, and cannot be fully accessed until later in the game when you have the Cut HM. 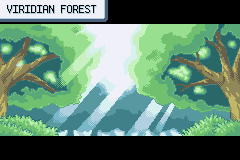 After walking in Route 2 for a while, you'll soon reach the Viridian Forest, a maze of trees full of bug Pokemon and a few trainers hoping to battle you. It takes a while to get through this large forest, as many trainers and wild Pokemon are itching for a fight. This is when a Charmander, Pidgey, or Spearow comes to good use. After catching a few bug Pokemon (and maybe even a Pikachu), finding a few items, and having a few intense battles, you'll arrive in Pewter City.